How is everyone doing today? Are you keeping up with your three daily things? It can be tough to be consistent when you first get started, I know I’ve been struggling a little with this. Instead of kicking myself over this, I decided to spend a little time figuring out what was holding me back. What was making it hard for me to manage to get these three, relatively little things done each day. My conclusion was that I didn’t take the time to really think about these things and what steps I needed to take to do them. More importantly, I didn’t take a moment to think about ways I could support these new mini goals. 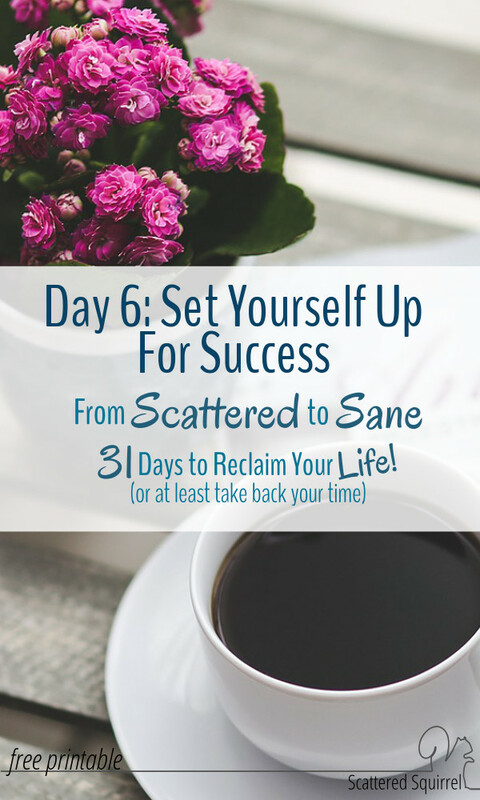 So today I want to chat a bit about how things you can do to set yourself up for success as you work towards taking back your time and reclaiming your life. I started my new three things a few days before the beginning of the month and I’ve been puzzling over how I could make it easier to get these things done. I mean, really, they’re just three things, this should be a breeze. But it’s not just three things. It’s three new things we’re adding to our day. Or maybe it’s not three new things, but they are three things we’re focusing more on each day. For some, these three things might require us to change our thinking or our habitual behaviour. So it’s important that we take a little time to think about ways we can support ourselves as we go on this journey. 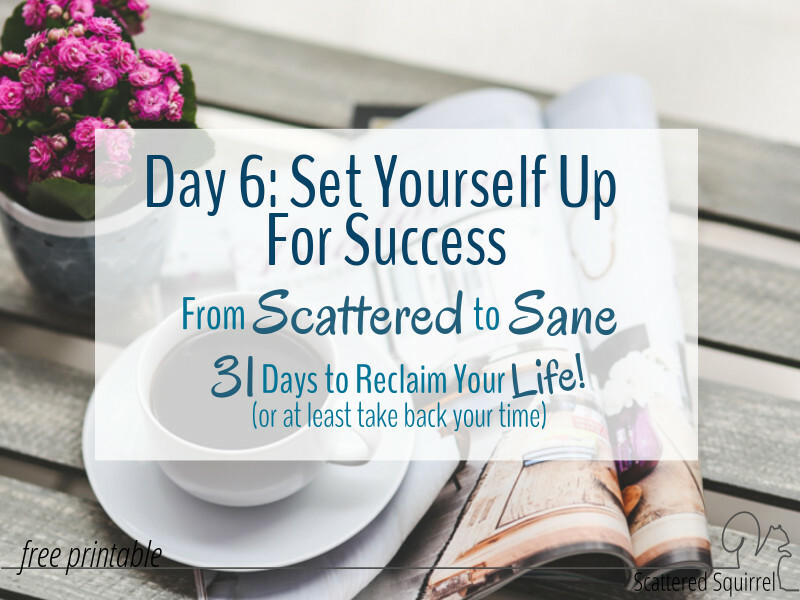 It’s important to take time to figure out how to set ourselves up for success. When it comes to building new routines and creating new systems, it is often easy to overlook the things we do every day that can have an impact on our new start. Often times these are things we no longer think about. Habits we’ve developed over time that can help or hinder our progress or that could mean adjusting our expectations. I mentioned in Day 4, I used to love to doing dishes in the morning. It worked really well for me for many years. I would get everything ready the night before and as the boys were eating breakfast I would wash up all the dishes. That no longer works with the flow of our lives, and I need to make adjustments in some way, or it will always remain a struggle. So how do you set yourself up for success? Below you’ll find a few things that might help. How Does Your Day Flow? Take a few minutes to think about how a typical day for you usually goes. Think about your typical day in general. What is your basic daily routine? Don’t get to specific, just think about how your day naturally progresses. Do you tend to be more productive during a certain part of the day? When does your energy start to fade? Do you take a while to get started in the morning? 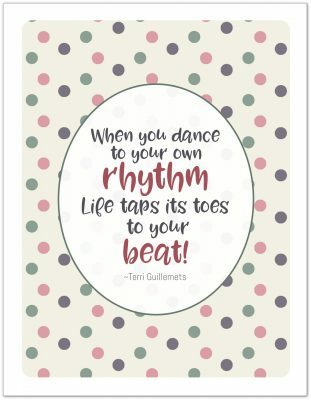 Understanding the rhythm and flow to our days can help us figure out the best time and way to implement new routines. Match your daily three to the times where they fit in the best. If your three are tasks that require lots of energy, don’t try to do them during the time when your energy level is typically in a lull. Set yourself up for success by fitting your daily three tasks into the time that works best for you. This little trick can effect a huge benefit in terms of successfully starting a new routine. Even when we’re not aware of it, many of us have routines or habits already in place. Those routines and habits shape our days in a general way as I mentioned above. We don’t have to change everything to make a new routine work for us, sometimes the best thing we can do it team it up with an old routine. We do this by finding an existing routine to tie our new tasks too. For example – doing one load of laundry a day is one of your daily tasks. You know from following the first suggestion that you tend to fold the laundry in the evening while watching your favourite shows. So instead of starting the laundry in the morning you’re likely to forget about it until dinner time, you could put a load in the washer right after getting home from work or picking up the kids. Depending on the time, either before you start cooking dinner or right after dinner it should be ready for the dryer. By the time your show comes on, or the kids are in bed, it’s ready to be folded. You’ve attached each step of the laundry process to an already existing routine and you’re working within your typical daily flow. By work with yourself you’re more likely to have an easier time establishing this new routine. This is sort of like a blending of the two above. Figuring out what things you can do to help support yourself while building this new routine is a great way to really think about the tasks you’re doing and how they fit into your life. 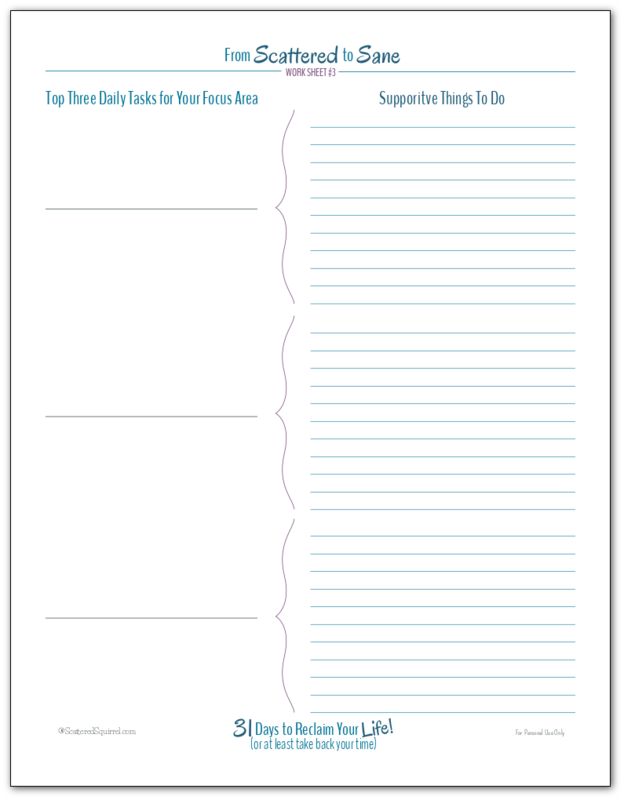 To help keep your ideas in one place I whipped up worksheet printable to help. I often find writing things down really helps me to focus. Down the left side jot down your three tasks and then use the space on the right to collect your ideas. To download your copy simply click the pic! 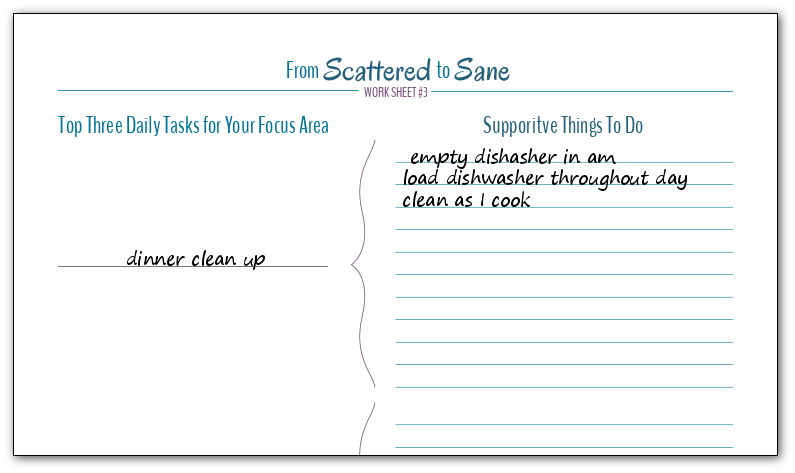 Below you will see that I started with my dinner clean up tasks and I jotted down a few things that will help me when it comes time to do that. There are a few other things on that list that I didn’t write down before making up the graphic, so here’s the full list, to give you an idea of what I mean. clean as I cook – always a good one but sometimes forgotten or put off because I usually need one sink empty and I don’t have a dish drying rack. As you can see, there are a number of things I can do to help make that one task easier. That’s exactly what we’re aiming for in this challenge. A system that works for us, not the other way around. Taking a few minutes to think about how you can set yourself for success, is one of the best things you can do for yourself. Now it’s your turn. What can you do to set yourself up for success? Drop me a line in the comments and share your thoughts. Previous Post: « There Will Never Be a Perfect Moment – Start Where You Are! Hi, I am an avid follower of your blog – I just love it! My question is what do you think of those Erin Condren planners that are so popular now? Do you have one of these or stick with your own printables? Hi Deborah, Thanks so much for your kind words. I’m thrilled to hear that you like the blog. And what a great question! Personally, I stick to my own printables though I do love the Erin Condren planners. The main reason I stick to my own is printables is that I like the flexibility of being able to change my planner up as time goes by. I also like to be able to add or take away sections from my planner as I try new things. For example, I just recently added in a meal planning section to my planner. I used to have it in our kitchen binder, but I use my planner all the time, so I thought I would give it a try keeping in my planner. If that doesn’t work I can just remove it. A pre-made planner just doesn’t offer that flexibility. My second reason is price. I have a hard time spending that kind of money on a planner that I can’t even reuse each year. However, that being said, if I was going to purchase a pre-made planner and money was not an issue, I would either go with a Life Planner Erin Condren planner or a Simplified Planner from Emily Ley. I think they’re both beautiful planners and I’ve heard wonderful things about both of them. Many friends of mine who’ve purchsed one or the other love them. I think it’s just a matter of what works best for you. Do you think you could take a minute to correct “Supporitve” to “Supportive” on the PDF file? IT’s been updated!!! 🙂 Thanks again for pointing that out to me. I appreciate you getting it fixed so quickly. Thanks!